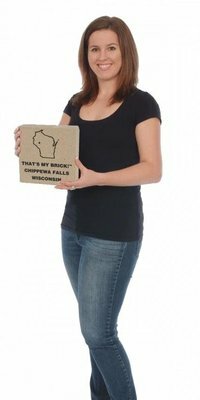 That's My Brick!® laser engraved bricks for fundraising came into being several years ago as an outgrowth of our trophy/award business (Trophies+) located in Chippewa Falls, WI. Our family owned company has combined our expertise in custom decorative coatings, precision engraving and volume manufacturing with the artistic ability and craftsmanship of our team! We are providing the highest quality products and a myriad of free services to help make your Brick Fundraiser or Donor Recognition program a huge success! Always remember that your satisfaction is paramount to us - all our products carry our 100% satisfaction guarantee. Please feel free to give us a call at 877-271-0217 or drop us a note and we'll do our best to get your questions answered immediately.